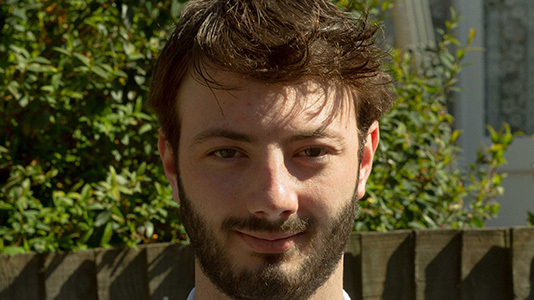 After deciding on a legal career following an enjoyable Law A-Level, Freddie was determined to live in London, making an LSBU the ideal choice thanks to our great reputation and central location. "In my second year, I studied a module called CCEU, which was a fantastic experience and opened my eyes to the prospect of working abroad," says Freddie. The module involved students from several universities studying together, understanding the issue of trans-national crime in the EU from a number of different perspectives." Preparatory work was done within each university, in advance of a trip to the host university - which for Freddie's year, was in Hungary. There, students from all participating universities worked together to co-write papers, and even lived together away from their lectures and seminars. "The coursework we undertook before we left - both the group essay and the independent paper - provided a really interesting opportunity to look at areas of EU and Criminal law we had already studied but in a different context," says Freddie as he recalls the experience. "The week-long intensive programme realty added to that work. The lecturers were from around the EU and were really interesting. The way they taught was very different, and that was a real eye-opener for me," he says of the experience. "It was just as interesting to write a paper with a group of students from the different universities in the programme. It was a very valuable experience, because the different perspectives we all had of the same topic allowed us to really explore the area of the study, and independently furthered our knowledge and understanding of the EU as a whole." Freddie believes that the study-abroad module was one of the best units he studied as part of his degree, and one that has had a profound effect on his future plans. "Not only was it really interesting subject matter, but it has inspired me to study in another EU country for a year to really widen my experience and perhaps give myself some new and different opportunities," he says. "I think that it will not only benefit my understanding of EU and Criminal Law, but will also give me much better career prospects." Freddie's ultimate career plan is to become a barrister, so a solid legal grounding was absolutely essential. I think that the course has prepared me well for a career at the bar, but it has done much more than that. It has given me the inspiration, drive and confidence to study abroad. That's something I would never have thought of doing before I studied here. After studying his Masters abroad, Freddie intends to return to London to complete his qualifications and take his place at the bar – and with such a cosmopolitan learning experience behind him, few would bet against him doing precisely that.